Seven layer dip is a delicious Mexican appetizer to take to or serve at a party or get together. It goes with everything, so you can serve it at tailgate parties, holidays, graduation parties, you name it. The best part is most everyone loves it. It’s easy to make, extremely versatile and quite irresistible. In fact it’s hard to stop eating it once you start. And if you want to make it 6 or 8 or even 9 layers, go right ahead I won’t tell anyone! You see with this dish you can add virtually any ingredient or as many layers as you desire. 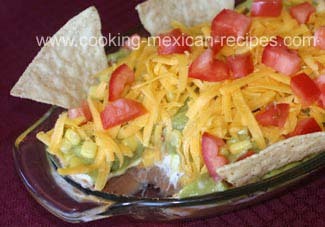 In fact, seven layer dip can be your dinner with all those layers of meat, beans, guacamole, cheese etc. Your basic 7 layer dip recipe usually includes a layer of refried beans, sour cream, green onion, grated cheese, olives, salsa, and guacamole or avocado. Go ahead and get wild with this recipe and see what you can come up with. 1. Drain the cooked whole beans and pour into a 2 qt. sauce pan and add water, vegetable oil, salt and coarsely chopped garlic. Heat to boiling then reduce heat to low. Stir frequently while you simmer the beans for 45 minutes to an hour. If the beans get to a point where all they want to do is stick to the bottom of the pan, then it’s time to mash them with the heat turned off. 2. Cook the hamburger and taco seasoning and add 1/3 cup water to help dissolve the seasoning into the meat. Remember to chill the beans and beef. Follow my directions for homemade guacamole. Sure you can go to the store and buy ready made guacamole but if you make your own by following my instructions, your homemade guacamole will make the dish. Store bought can’t touch it. If you are using tomato instead of salsa for a layer, chop it up now so it will be ready when it’s time to put it all together. Open the can of corn and drain. Now you are really ready to assemble your seven layer dip. You can use any glass dish you have on hand. I sometimes use a 10 inch pie plate, an 8 inch square or a couple of smaller glass dishes if I need to set out appetizers in several locations. Glass is nice so you can see the layers but not absolutely necessary. Layer the beans first. Make the layer about 3/4 inch thick. Then place the beef on top. Next comes the sour cream. Use your fingers to help spread the sour cream over the meat. Add a nice layer of guacamole and then the corn. Sprinkle the cheese all over and top with the chopped tomato or salsa. Was that seven layers already? Chill 1/2 hour before serving. This seven layer dip recipe is perfect served with tortilla chips. Now sit back and watch it disappear! Check out my other appetizers and don’t forget those margaritas!